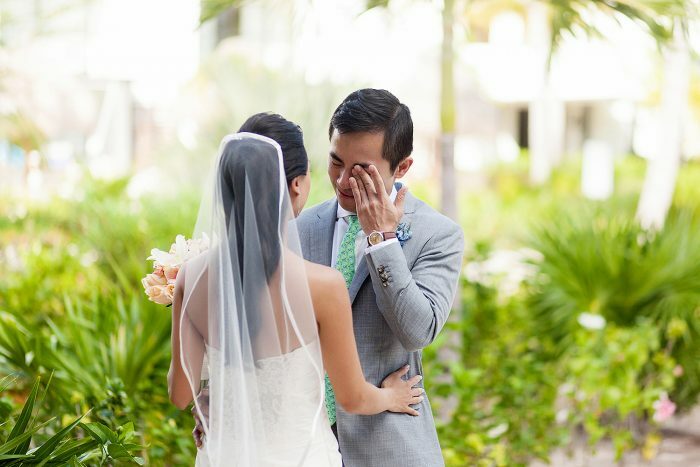 Should you do a First Look at your destination wedding? First Looks are becoming more popular these days, and it is totally understandable, But personally, I am not a fan. At a non-destination wedding, the couples often do not see their guests much at their wedding, and doing a first Look is a good way to ensure that you get more time with your guests, and less time with your photographer. However, being that everyone is in one location at a destination wedding, I am not a fan of the ‘First Look’, except in a few special circumstances of course. Back in Canada, when I was photographing weddings, I would meet up with the bride around 11:00 am to 1:00pm in the afternoon for getting ready photographs. Namely: portraits of the bride, the bride with her family, and the bride with her bridesmaids. My second shooter would go to the guys and do a similar thing. Then we would go to the ceremony. After the ceremony, there would be little time for guests to congratulate the new couple, until I whisked them away (usually on the grounds) for family photographs. After family photos, we would drive to one or two locations for group photos, with the bridal party, as well as portraits of the couple alone. This whole process would take about 2-3 hours to complete and finally it would be time to head back to the reception, where the couple would be able to spend some time with their guests. Generally, I would see couples spend very little time with their guests at a wedding, so when couples started asking if they could do a first look before the ceremony so that they could spend more time with their guests, I completely understood. See, I know I’m a pretty cool guy, but I’m nothing compared to their close friends and family that they actually know (yes, that’s called sarcasm :) ). In all seriousness, I truly liked the first look in these weddings. It gave couples the opportunity to do something I felt was the right thing to do; spend more time with family and friends on their wedding day. Destination weddings are different. 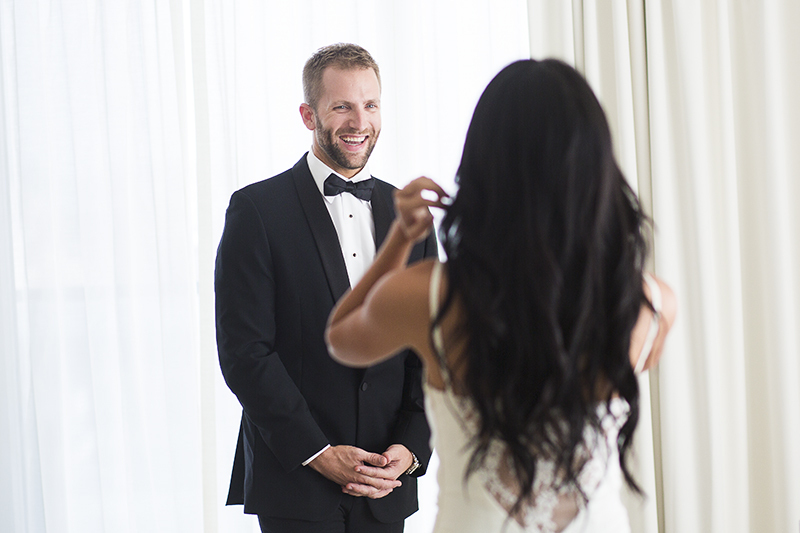 At an average destination wedding we photograph the getting ready images, we head straight to the ceremony, have a champagne toast after the ceremony, then it is time for hugs and congratulations and toasts. I then take a photo of everyone that attended the wedding, followed by family group photos, and then we head off for thirty minutes to an hour to take photos on the beach and on the grounds around the location with the bridal party. During the one hour we are away, the wedding guests generally have a cocktail hour, and enjoy some drinks and conversation. Often, I return with the couple within an hour to rejoin the guests. All told, the couple is away from their guests for 30-45 minutes on their wedding day. Furthermore, at a destination wedding, your guests are with you for longer than the one night. and you have a chance to spend quality one-on-one time with them far before and after the actual wedding day. This is the main reasons why I believe that destination weddings are so much better than weddings back home. They are much more than just a one day event, they are more like a week long celebration of two families becoming one. Back to photography; being that the bride and groom are not away from their guests for very long on the day, and because they are able to spend time with them outside of the wedding day, I do not see the need for a first look in most cases. However, there are a few circumstances where a first look might be appropriate. If you are the type of couple that would prefer to see each other in private for the first time, so that it can be a special moment for you, then this is a personal decision that I am more than happy to fully support. Not everyone is into public displays, and if you want this moment in private, then lets do it. However, even if you do your first look before the wedding ceremony, I would still suggest doing the majority of your wedding photos after the ceremony, and right before sunset, as that is when the light is the best. It’s easy to work with, it will take less time to photograph, and you will look your best. Another time I suggest a first look is when your ceremony time is too late into the day and you are not able to do your photographs after the ceremony. For instance, if your ceremony time is an hour or less before sunset, then you will likely not have enough time for photos after the ceremony, and you will have to do them before. I case that is not clear, here is another way of describing it. If the sun sets at 5:00 and your ceremony is set to start at 4:00, then I suggest you do a first look at around 2:30 or 3:00 so that you can get some photos while the sun is still in the sky. Those are the only two times when I would suggest a first look that I can think of off the top of my head. All couples are different and all weddings have their unique circumstances, so a first look may be right for you. Just know that it is something that we rarely do here in the Riviera Maya, Mexico. I hope you find my opinions on first looks helpful. If you have any questions about your wedding day, and/or how to plan it out, please do not hesitate to email me at dean@deansanderson.com and either myself, Anna, or one of my assistants will be more than happy to help.